Four former NHL players were announced as inductees into the Hockey Hall of Fame on June 29. The group included a trio of defencemen - Phil Housley, Nicklas Lidstrom and Chris Pronger - along with forward Sergei Fedorov. Four former NHL players were announced as inductees into the Hockey Hall of Fame on June 29. The group to receive one of the sport’s highest honours included a trio of defencemen - Phil Housley, Nicklas Lidstrom and Chris Pronger - along with forward Sergei Fedorov. The former NHLPA members each had highly distinguished NHL careers, and helped lead their respective teams to great success. The NHLPA would like to congratulate the newest additions to the Hockey Hall of Fame, and recognize their outstanding efforts on the ice and within the community. Angela Ruggiero (Player category), Bill Hay (Builder category) and Peter Karmonos Jr. (Builder category) were also announced as inductees. TORONTO (June 29, 2015) – Lanny McDonald, incoming Chairman of the Hockey Hall of Fame and John Davidson, Chairman of the Selection Committee, announced today that seven individuals have been elected to Hockey Hall of Fame Honoured Membership, five in the Player Category and two in the Builder Category. The vote took place today at the annual meeting of the Selection Committee in Toronto. “The Hockey Hall of Fame is proud to welcome these seven hockey legends as Honoured Members,” said John Davidson. “Their contributions to the game of hockey are well documented and their election to the Hockey Hall of Fame is richly deserved.” In the Builder Category, Bill Hay and Peter Karmanos Jr. were elected. The first NCAA graduate to play in the National Hockey League, Bill Hay’s contributions to hockey span from grassroots to the professional level. His distinguished hockey resume includes contributions made while serving as President and Chief Operating Officer of Hockey Canada, President and Chief Executive Officer of the Calgary Flames, and most recently as Chairman of the Hockey Hall of Fame. “Being included in the Hockey Hall of Fame class of 2015 ranks right up there with winning the Stanley Cup,” said Karmanos. “Hockey has a special place in my heart. It is the greatest team sport, and I believe the greatest game a boy or girl could play. Giving more kids the chance to play at the highest levels has truly been a labour of love.” In the Player category, Sergei Fedorov, Phil Housley, Nicklas Lidstrom, Chris Pronger and Angela Ruggiero were elected. The first Russian to reach the 1,000 point milestone in the NHL, Sergei Fedorov played in six All Star Games, captured three Stanley Cups with the Detroit Red Wings, and was awarded the Hart Memorial Trophy as the league’s most valuable player in 1994. The second-leading scorer all-time amongst U.S.-born players, defenseman Phil Housley played in seven All Star Games over a remarkable twenty three season NHL career. He also ranks third all-time among all NHL defensemen in scoring. A seven-time recipient of the James Norris trophy as the NHL’s top defenseman, Nicklas Lidstrom also captured four Stanley Cups with the Detroit Red Wings and an Olympic Gold Medal for Sweden. One of the toughest competitors to ever patrol the blue line, Chris Pronger captured both the Hart Memorial Trophy and James Norris Trophy in 2000. The native of Dryden, Ontario also captured two Olympic Gold Medals for Canada and a Stanley Cup with the Anaheim Ducks in 2007. The youngest member of the team that captured the first-ever Olympic Gold Medal in women’s ice hockey, Angela Ruggiero went on to help the United States capture four more Gold and six Silver World Championship medals. The defenceman from Panorama City, California, was also named Harvard’s player of the year three times. The 2015 Induction Celebration will be held on Monday, November 9th at the Hockey Hall of Fame in Toronto. 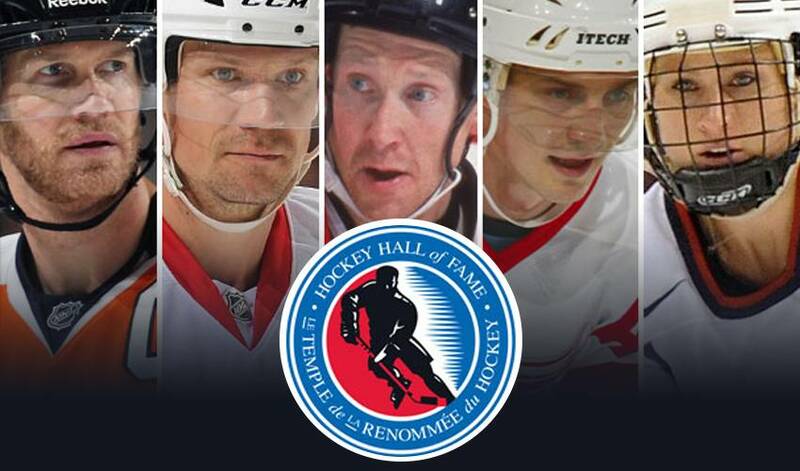 For more information regarding the 2015 Induction Weekend/Celebration, visit http://www.hhof.com.